and the City of a Thousand Planets and the first teaser has arrived and it doesn't disappoint. 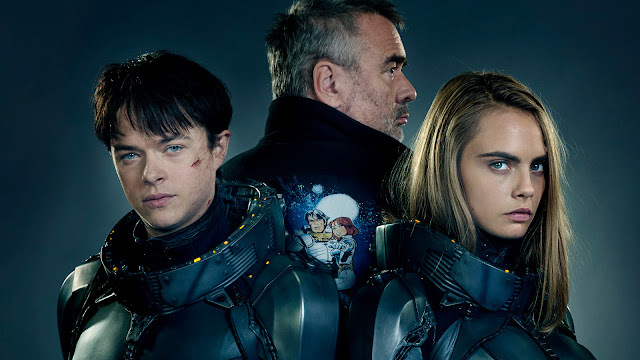 Based on the French comic book series written by Pierre Christin and illustrated by Jean-Claude Mézières about time-travelling operatives Valerian (Dane DeHaan) and Laureline (Cara Delevingne) who work as the universe's peacekeepers. It co-stars Clive Owen, John Goodman, Rihanna, Rutger Hauer, and Ethan Hawke. The trailer below features the Paul McCartney-Ringo Starr-approved "Because," one of the first Beatles licensed songs released for a movie in decades, that sets the tone for the big sweeping science fiction epic. Full of dazzling effects, inventive alien designs, and plenty of exciting action, 'Valerian' has the look and feel of 'Fifth Element' amplified ten-fold. Valerian and the City of a Thousand Planets is scheduled for release July 2017. Under directive from their Commander (Clive Owen), Valerian and Laureline embark on a mission to the breathtaking intergalactic city of Alpha, an ever-expanding metropolis comprised of thousands of different species from all four corners of the universe. Alpha’s seventeen million inhabitants have converged over time- uniting their talents, technology, and resources for the betterment of all. Unfortunately, not everyone on Alpha shares in these same objectives; in fact, unseen forces are at work, placing our race in great danger.